“Don’t worry ’bout your troubles and your strife…” It’s all about the Bear necessities — like me, Bear! 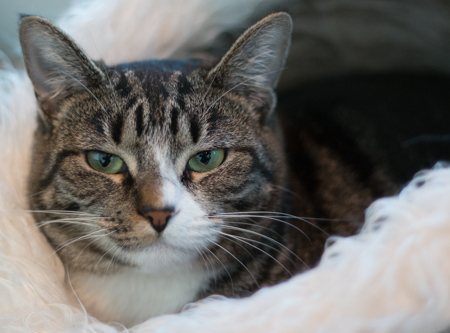 I’m an adorable 1 1/2 year old tabby girl and I’m pretty sure you’ll find me to be a necessity once you meet me! I’m extremely sweet and will roll over for chin scratches and belly rubs. I’m pretty talkative and will chirp at you for attention! I’m so so sweet that sometimes I’m a little coy, but with a small amount of encouragement, my love for human attention will bring me right out of my shell. I’m currently living peacefully around lots of other kitties (including rambunctious kittens!) in the Pixie cattery, so I know I’d be alright around another cat, but I think I’d be just as happy in a home of my own as well. I am a princess, after all! Come on down to the great Pixie jungle and say hello so we can become best friends! I come to you spayed, vaccinated, and micro-chipped for an adoption fee of $100.